Hello everybody! I am new at the forums, but I've been working as a dollmaster for 20 years now. 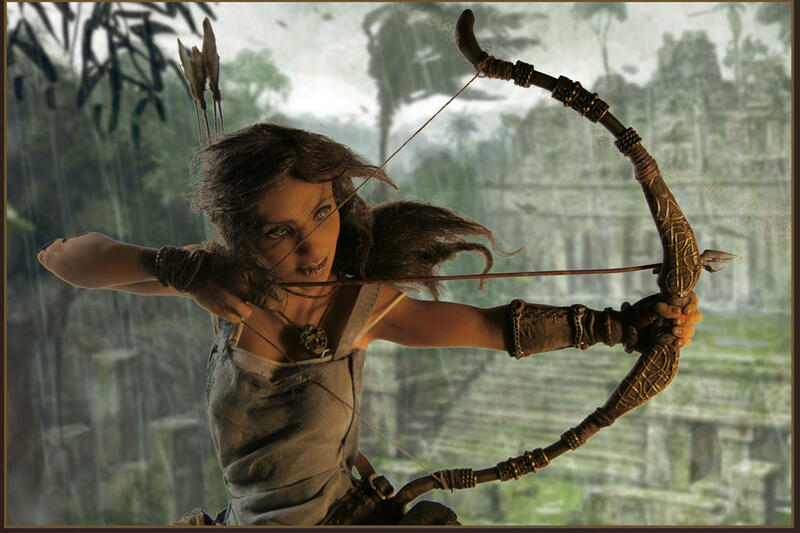 I present to you my vision of Lara as I would love to see her in the upcoming game. I tried to blend old and new faces of Lara. The ancient bow is still there, but she has a new axe and more classic outfit. Enjoy. So you mold the figures yourself? I think you're very talented in that respect and I took a look at some of your other dolls (figurines?) and they're lovely. I particularly like the wind bride. This Lara is nice, I like what you did with her upgraded weapons. Just one thing: What's wrong with her mouth? Is it the lighting. but her lips look scabby, like she has really dry cracked lips. My Fan Fiction - New! So the rumours are true! Thanks a lot, friends! and THAT is what's happened yesterday, YEAH! My doll is "The Treasure of the week"!! So far, I would like to present another dolly I've made 2 years ago for Karl Stewart and Maegan Marie. This dolly has a cameo in the last part of the "Final Hours" film.